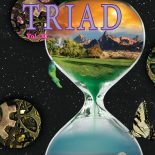 The TRIAD 2006 cover was designed and digitally manipulated in Photoshop CS2 by Geshonda Manning. Hillsborough Community College and the TRIAD staff are proud to present the 2006 edition of the TRIAD, HCC’s features and literary/fine arts magazine. This year’s TRIAD represents a wonderful variety of poems, photography, fiction, non-fiction, and art. This year’s motif emerged after a productive turnout of submissions regarding freedom of speech. We invite you to take a journey through “Costa Rica,” “A Study of American Poverty,” “ A Big Cause for Big Paws,” “New York City,” “Three Generations of Domestic Abuse,” and “How much Information is too much Information?”. My goal this year was to put together a magazine of which our school could be proud and that would encourage new students to get involved with the student publications. This year, I had a brand new staff, and what a wonderful staff they are! You have to appreciate students who will work late nights and weekends! I am so grateful to have the opportunity to work on the Triad for my second and final year. I’m grateful for a dedicated publications’ team and faculty advisers who gave me this opportunity to put together another wonderful publication. I also want to thank my fiancé David and David Jr. for putting up with the many meetings and late nights and for their support throughout the year. I couldn’t have done it without them. My experiences at HCC have made me into the leader I am today. I will never forget this opportunity, and I will continue to encourage students to get involved. It changes a person’s life and instills an appreciation for the people who work so hard putting together any publication. I thank everyone who hung in there to the end. Even though Paul Simon wrote these lines decades ago, they still serve as startlingly appropriate exhortations today. modern day journalists and press syndicates find themselves under investigation by the national Security Association for violation of a laughably vague law. The Espionage Act has become the government’s wild card and ensures an unbeatable hand every time. As Travis Hearne mentions in his article, the freedom of speech often falls as the first casualty of war. We designed this year’s TRIAD to celebrate the power of the free press. While Hearne debates the delicate balance between the public’s need to know and the government’s need to protect, Carrie Kolba warns readers of the damage that unchecked personal writing, especially in an open forum such as mySpace.com, can cause the author now and in the future. All of the contributors have exercised their right to express themselves by submitting their stories, poetry, and art to the student publications. To simply state that I have thoroughly enjoyed my time on the TRIAD staff would come miserably short of the truth. Where else can one participate in a conversation that weaves effortlessly from langston Hughes to the physical properties of oxygen to the Teenage mutant ninja Turtles’ theme song? The people attracted to this group have amazing personalities, and I feel distinctly honored to have made their acquaintance. I hope these friendships continue because I don’t think I’ll ever find better dancing partners or singing partners or writing partners or Chick-Fil-A-eating partners. The list of people to thank has so many important names that I fear the microphone will disappear before I finish. Here goes nothing! much appreciation to Dr. Richard Gaspar and Dr. Janice Sumner-Kenefick for their administrative support…to Carrie for stressing the point that I had to have a clear head…to Geshonda for shaking it with me in New York and pulling both magazines together in the final hour with little help…to Sidney for working it cow-style…to Mikey, Nicholas, and Christian for not destroying the lab (that much)…to Michael for keeping the house standing (better than I ever could) in my long and frequent absences…to Papa for arriving on a white horse as necessary (as always)…and many many more.